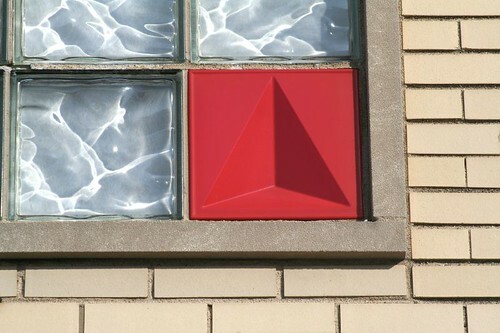 It was a Flickr contact’s photo that alerted me to the existence of the Imperial Glass Block Company, up in the inner-north suburb of Niles. 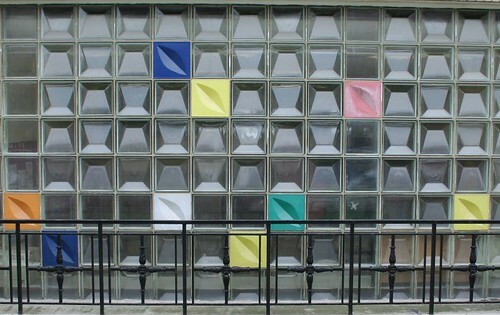 Their storefront operation has wall panels displaying different makes of glass block, including a circa-1960s design I’d seen around town. Based on that, I figured they might be able to direct me further in my quest information on the colored geometric blocks I’ve been tracking all over town for the last year. Dropping by for a visit last Sunday, I found them (unsurprisingly) closed, but peering in their windows, I beheld a miniature wonderland of glass block in all sizes, shapes and colors. And there, on a shelf, off in the distant corner, sat the golden prize: one of my blocks. I knew I had to come back. Today, I finally did. The current head of the business, son-in-law of its founder, was happy to spend a few minutes chatting about the company and its products. He was also happy to tell me what he knew about the blocks. Their proper name is “sculptured glass module”. 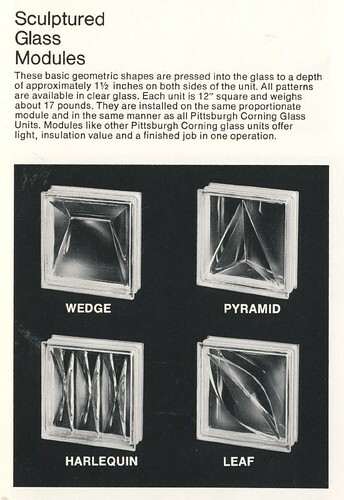 They were made in the 1960s by Pittsburgh Corning (still a huge name in the glass block business today). They come in four designs: Leaf, Harlequin, Pyramid, and Wedge. Earlier versions came with the one-sided baked-on color coating, introduced in 1958; eventually that was discontinued in favor of clear one. 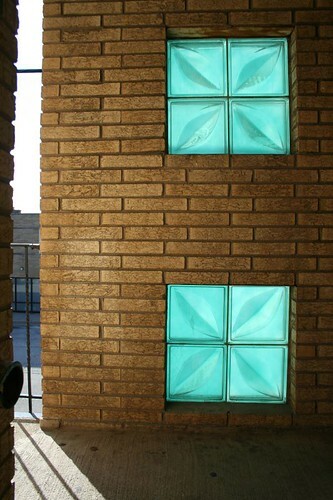 A fibrous insert, a thin panel built into the center of the block, could render the clear colorless versions translucent. Neither kind has been manufactured for many years. Three companies sold them in Chicago: Imperial, the Fred Beyer Company (defunct some 15 years now, though a company selling glass block and windows remains in its original building), and the Hardy Corporation. Hardy’s building is worth a post of its own, but unfortunately I managed to leave home today without a card in my camera. Whoops. Their popularity in the 1960s stemmed at least in part from their size: at 12″ x 12″, they require substantially less labor and only 1/4th the number of blocks to fill the same square footage as more common 6″ x 6″ blocks. Pittsburgh Corning made other designs in the 1960s that were also popular in Chicago. Among them is the Chiaro line, which came in two different patterns. The wall below is on Belmont, and features Chiaro II blocks. The blocks featured an hermetically sealed partial vacuum to increase their insulating value and decrease sound transmission. At 8″ x 8″, they are smaller than the sculptured blocks; they are partially covered with an opaque black fired finish. Another popular option was the Intaglio Glass Wall Unit, with a recessed pattern surrounded by an opaque gray area. The center design is made of “antiqued” glass, while the blank area is finished with “frit”, fused into the glass. The two types above are Intaglio II (hourglass) and Intaglio III (circle). They also came in ovals, groups of four small circles, and blank “filler” panels with only the frit finish. 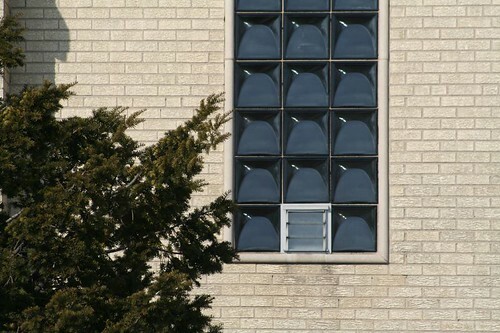 A competing design style was manufactured by Owens-Illinois about the same time, the Crescent Design block, sold in Royal Gray, and affectionately referred to by Hardy staff as the “toilet seat” design. Owens-Illinois seems to have gotten out of the glass block business today, focusing instead on glass packaging. Why these designs were so popular exclusively in Chicago, while none are to be seen in Milwaukee or St. Louis, remains a mystery. It ties in to larger questions about Chicago’s 1950s and 1960s development: with so many architects and builders working on it, why was it all so homogeneous? 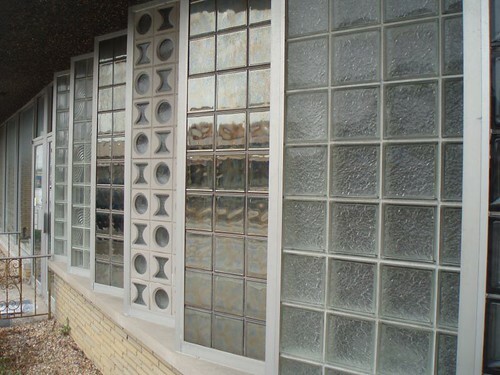 And more specifically, was there specific purpose in the glass block patterns seen on the fronts of so many single family homes? I have a suspicion that various pattern types may have served as a particular builder or designer’s signature, but no evidence — yet — to back that up. What a great historical background! Oh god, I’m jealous of your excursion/field trip. Do they do vendor lunches? I’d love to be able to use some of these some day. I think it’s just a continuation of Chicago’s vernacular tradition, which extended far back to bungalow days and extends to tri-levels (Which are, btw, still being built in the south suburbs) via the little post war bungalows, which have tons of glass block. I would suspect though, that there weren’t many architects involved, more builders meeting a local demand (or just copying their competitors). As a side-bar/note, there is surprising variation in current (well, up until last year) suburban housing production. The sourthern/NW Indiana and some SW ‘burbs follow a longer Chicago tradition of a local vernacular. 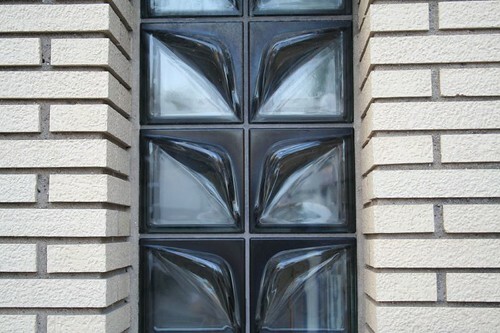 For instance, casement windows are almost never seen in western, NW and northern ‘burbs, but are very common in the southlands. It’s actually quite interesting that we have this variation. I think part of it is the bigger, generic national developers have concentrated on the, to quote a friend of the family “executive trash” western suburbs and northern suburbs, while leaving the local builders to the south. OK, I got a little, just a little bit, carried away there. Many of the ads I’ve found do cite architects for various apartments and houses. I need to post a sampling. The local gas company — People’s Gas Light, I think — used to take out 2-page spread ads promoting new homes that offered gas cooking, with the architect and/or builder listed below. These modules are stunning and would look amazing anywhere. There should be more of these around!